This morning at Tatogga RV Resort we had very little water pressure, so we continued to use our on-board fresh water tank. During the night two more RVs came in. It made us wonder who would drive this road at night. Especially in a large motorhome pulling a truck! Our weather today was a continuation of yesterday with dark, gray, cloudy and rain showers in the morning that turned to outright rain for the last few hours of our drive. At least a lot of the mud from yesterday got washed off by the rain. Today’s road was much better. We are far enough south now that frost heaves are no longer an issue and the whole road was paved today. Some of it was very rough, but we also enjoyed a 100 miles of the smoothest road we have seen in months. We didn’t see much of the peaks because they were covered in clouds but we could tell that these are really tall mountains. The road basically follows one river for awhile and then goes over a divide and follows the next river for awhile. 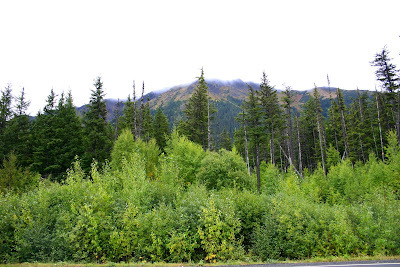 We drove through miles of evergreen forest with birch trees that have not started to turn yellow yet. 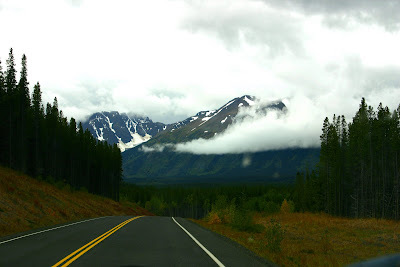 Most people that travel the Cassiar Highway to or from Alaska make a detour to Hyder, Alaska. This is the southernmost town in Alaska and can only be reached by sea, air or the Cassiar Highway. 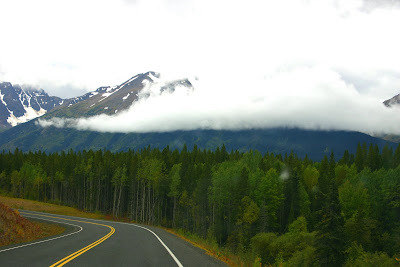 It is a 40 mile trip to Hyder from the junction of the Cassiar Highway, we elected to not go to Hyder. On a raining afternoon we didn’t think we needed to do an 80 mile detour to see a few bears. To our surprise we saw 3 black bears along the road after passing the turn to Hyder, in the first 10 miles. We saw a mother and a cub walk across the road and one bear just sitting beside the road. I stopped to see what the bear sitting by the road was doing, but you can’t sneak up on a bear driving a diesel and he headed into the woods as we came to a stop. 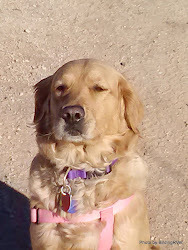 We drove 310 miles today which is much further than we had planned. 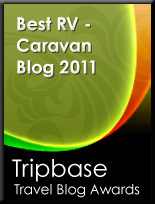 The first two RV Parks we came to at the end of the Cassiar Highway were closed. The second one was most interesting because it still had the signs up on the main road saying that the RV Park was just ahead and “turn off here”. We followed the signs off the main road and about half a mile up a hill on a muddy dirt road only to find the gate locked and a “closed” sign on it! You think they could have taken down their signs for the season or at least put a closed banner on the sign at the turn off. So, here I am on a muddy dirt road on the side of the hill with a 20 foot truck pulling a 35 foot 5th wheel and I now need to make a three point turn!! YES, I DID IT but I would rather not have to do it again. 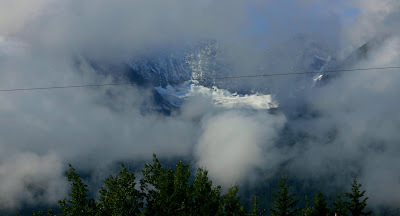 So we are now about 5 miles west of Smithers, British Columbia at the Glacier View RV Park, which no doubt has a view of a glacier if it stops raining and the clouds lift. 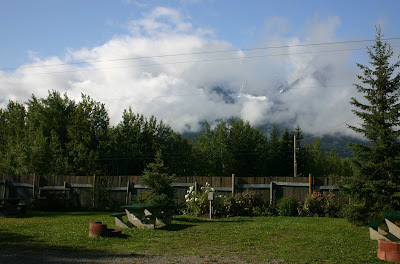 When Kathy took Raider for a walk after dinner the clouds rose briefly to expose two very steep pointy mountains and a huge glacier suspended between them! Due to low light no pics, but hopefully tomorrow there will be more light to get a photo or two!